Mount Pleasant matters. 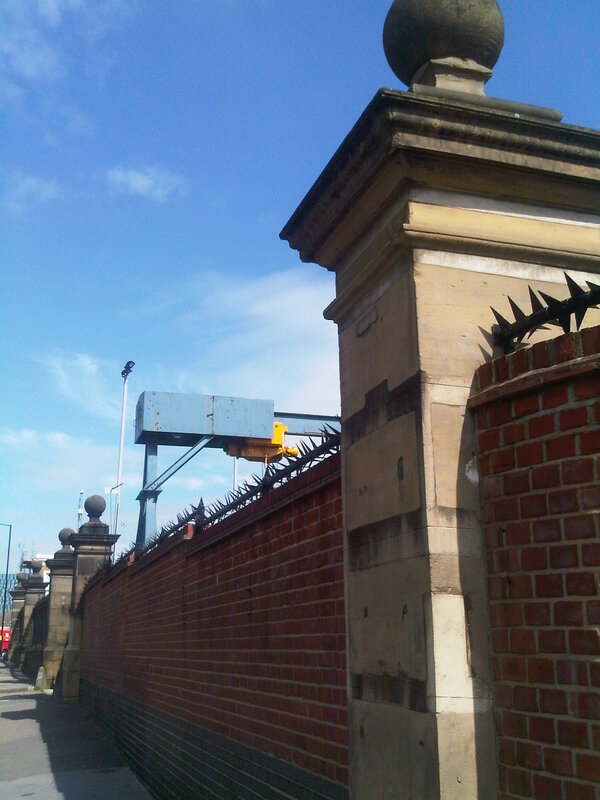 Formerly a prison, it’s one of the few large, undeveloped brownfield sites left in central London. 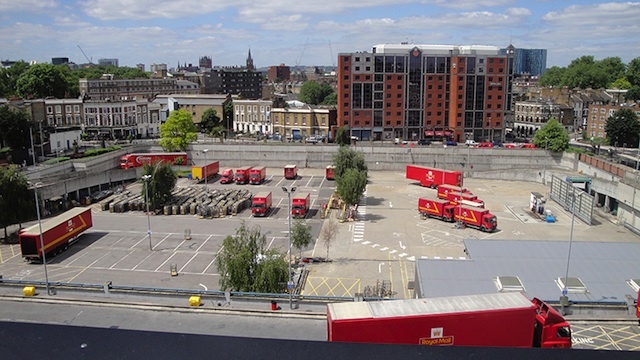 Few object to redeveloping the unpleasant wasteland behind the Royal Mail’s sorting office, where Second World War bomb sites are still used as outdoor car parks for cars and mail vans. But Boris Johnson’s decision on October 3rd to approve plans for 681 homes, none of them genuinely affordable, and despite overwhelming opposition from local residents and their councils, means that Mount Pleasant might soon be infamous as the deathbed of affordable housing in central London. Mount Pleasant straddles the boundary between two Labour-controlled boroughs, Camden and Islington, which have grappled with heavy spending cuts handed down by the government and a growing housing crisis. With waiting lists for council homes mounting and average property prices in both boroughs nudging £600,000, the need for affordable housing has never been so great. Planning applications for 681 homes, submitted in 2013 just as the Royal Mail was being privatised, could hardly have been more badly timed. The architects – AHMM, Feilden Clegg Bradley, Wilkinson Eyre and Allies & Morrison – are well respected but the big, boring blocks they propose for the site achieved the rare feat of annoying both the posh neighbours and the two councils. From the start, the Royal Mail said that only 10 to 20% of the new homes could be affordable. Despite planning policy that stipulates that 35% of new homes in big developments should be affordable, they insisted that any more would be unviable – even after the two councils commissioned their own viability study, which argued the scheme would still make money if 50% of the homes were affordable. No Labour council was ever going to approve a development that delivers so few affordable homes, is fiercely opposed by its neighbours, and whose applicant is a recently-privatised utility suspected of making a killing at the public’s expense. Just as the applicants protested that more affordable housing was “unviable”, the national media was reporting that Royal Mail had been undersold by up to £1bn. The Royal Mail emphasised that its museum and archive would be rebuilt on the site and the historic “mail rail” system opened up to visitors, but this cut little ice with politicians who wanted to know how a company undergoing privatisation, and seeking to develop 12 acres of central London as housing, could possibly warn that it was going to lose money. Royal Mail argued that it plans had nothing to do with privatisation but, predictably, few believed them. A perfect storm was brewing. In 2012 and 2013 I worked as a public affairs consultant on the project, giving political advice and helping to run some of the community consultation. My role was to act as a go-between between the developers and the councils and see if their objections could be overcome. It soon became clear that it was a hopeless task. A dozen architects and consultants would meet weekly with the Royal Mail in an office block by Liverpool Street station. While many of them were charming, professional people they had all been working on the scheme for many months. Cabin fever and dysfunction had set in. It was a bit like turning on the TV and picking up a re-run of Who’s Afraid of Virginia Woolf halfway through: everyone’s angry and at first you can’t work out why. It was a small compensation that the office we met in had spectacular views over central London – including, in the distance, Mount Pleasant itself. There was bitterness everywhere, and a collective failure to understand the politics of the two boroughs. A public meeting organised by Islington had descended into a shouting-match. Requests from Camden to consider putting a secondary school on the site were dismissed. I suggested that a donation from the Royal Mail to the nearby Calthorpe Project (a community garden much favoured by Camden councillors) would go down well, but nothing happened. The architects justified the tall blocks they proposed – up to fifteen stories high – by saying that most of them would be no higher than the ugliest building nearby: the Holiday Inn on Farringdon Road. They forgot that most of the scheme’s well-heeled neighbours live in Georgian and Victorian terraced houses no more than two or three stories high. My efforts to explain that the two councils would not grant consent unless there was a lot more affordable housing fell on deaf ears. By the time meetings with local politicians were sought it was too late. Islington’s cabinet member for Housing, James Murray, refused point-blank to meet with the Royal Mail until they increased the amount of affordable housing on offer. When we fixed a meeting with Islington’s Leader Catherine West, she stood us up claiming a (possibly diplomatic) illness. Many of the architects, consultants and other hangers-on were furious but as a hardened politico myself I could quite understand what was going on: the council was playing hardball, and who could blame them? Part of the problem was the siege mentality of the Royal Mail: even its “external relations” people seemed repelled by the idea of external relations with anyone. Efforts to reach out to the Communications Workers Union (which most postal workers belong to, and which used to sponsor one of the local Labour MPs, Emily Thornberry) were suggested. One of the scheme’s best features was that alongside the new homes on its car park, the sorting office would in fact expand. If a local MP could be persuaded by postal workers that the scheme would secure the future of their jobs, there was some chance that she might look on the plans more kindly. But the suggestion was rebuffed: industrial relations in the Royal Mail have always been confrontational, so the idea of attempting collaboration with the trade union was out of the question. The closure of the on-site nursery at Mount Pleasant, and Royal Mail’s refusal to reopen it, only annoyed Labour councillors and MPs further. After I stopped working on the project a year ago things got even more acrimonious. Many of the scheme’s local critics – including the architectural photographer Edward Denison and Thomas Heatherwick, designer of the Olympic torch, the new Routemaster and the Garden Bridge – were heavyweights who know what they are talking about. But when Heatherwick blasted the plans as “cheap, bland and misconceived” the architects replied frostily to say that “Thomas Heatherwick has contacted members of each practice apologising for his comments while acknowledging that, when he wrote his letter, he had not examined the designs in any detail,” adding that it was “unfortunate that Thomas Heatherwick did not participate in this [consultation] process until the mayor got involved.” In other words, don’t slag off our work before looking at it in more detail. Local residents were not impressed and opposition to the scheme only hardened. Boris was accused of making up his mind to approve the scheme in advance. Alternative plans drawn up by Francis Terry and lobby group Create Streets for the Mount Pleasant Association – neo-classical mansion blocks around two new open spaces, Mount Pleasant Circus and Fleet Valley Gardens – may annoy modernists. But they would actually deliver more new homes – and more affordable home – in buildings much lower than what Royal Mail proposed. The Royal Mail’s final plans have 163 (24%) of the 681 homes as “affordable”– but in the small print there’s a big catch. 98 of these 163 homes are on a so-called “affordable rent” of up to £2,800 a month: on average, 44% of market rent but hardly affordable to most Londoners. The other 65 are even less affordable “shared ownership” homes. A big reduction on market rents sounds great, but not in a part of London where it’s impossible to find a two-bed flat for less than £400 a week on the open market. Boris was quick to rush out a press release claiming the credit for doubling the amount of affordable housing from the 12% originally proposed, but 20% affordable housing was promised at a public exhibition way back in 2013. Don’t believe the spin. The insensitivity of the applicants made it certain that Camden and Islington would refuse their plans. But, truth be told, the applicants did not really care: they always knew that they could go to Boris and get a fair hearing. In January 2014 – before Camden and Islington had turned them down – the Royal Mail got the first punch in by asking Boris to “call in” the planning applications and overrule the councils’ decisions. The plans’ approval shows not only how out of touch from reality Boris Johnson – now more interested in his return to parliament than in delivering for London – has become. It also shows how rotten our planning process can be. Despite all the rhetoric about “localism” planning decisions in London are more and more centralised, with the mayor over-ruling local councils 12 times since 2009. Ideological hostility to proper affordable housing has over-ridden local needs. With hindsight I understand the bitterness I witnessed at meetings with the Royal Mail was really just boredom: they were going through the motions of consulting local people but were impatient to deal with the real decision maker in City Hall. The public consultation and political strategising I was involved with was just window-dressing. In December 2010 the new coalition government unveiled its Localism Bill, promising to “devolve greater power and freedoms to councils and neighbourhoods, establish powerful new rights for communities, revolutionise the planning system, and give communities control over housing decisions.” Four years later, the promised “new era of people power”, which already looked shaky, has come to an ignominious end in the heart of London. Sadly, London will have to deal with the consequences long after all the planning consultants have gone home, and Johnson has departed City Hall. This entry was posted in Uncategorized and tagged Architecture, Boris Johnson, Conservatives, Mount Pleasant, Planning, Royal Mail. Bookmark the permalink. This is a very insightful account of what happened behind the scenes of this sorry saga and chimes very clearly with the Mount Pleasant Association’s experiences over the years. The one error worth highlighting (since it is touched upon twice) is the assertion the neighbourhood is ‘posh’ and that this is the reason for the community’s stiff opposition – chiming with Boris’ ‘bourgeois nimby’ jibe, which creates a powerful and misleading narrative where none existed. This is not merely unhelpful and untrue – the situation is much worse than that. Those most affected by this brutal scheme are council tenants and the buildings most affected and overshadowed are council owned properties. The residences around the site are almost entirely council owned. It’s one of the complexities (and delights) of our neighbourhood – things are not always as they seem. The Georgian terraces you refer to were compulsorily purchased decades ago by Camden when no one wanted to live in London and today predominantly house council tenants. To understand the true nature of the Mount Pleasant neighbourhood, look no further than Christopher Hatton Primary School on its southern perimeter, where the 36 nationalities are represented among the 210 pupils. Nevertheless, thank you sincerely for you shedding light on the actual events that the local community was never allowed to participate in. Thanks for your comments. I’m sorry if the word “posh” offended anyone living near the site. I agree that the site’s neighbours are a mixture of different housing tenures and many of them are council tenants, but it is also fair to say that many of them are well-heeled given the very high property prices locally: another reason why there should be genuinely affordable homes on the site. No offence taken! However all the immediate streets surrounding MP are 90% occupied by Council or Housing Assoc tenants (Wren, Pakenham, Calthorpe Streets, Mount Pleasant and Farringdon Road). No problem…..glad we seemed “posh” to you….though we’re not. Good insightful article. Judy Dainton ( one of the “non-posh” who spoke at the GLA. Also, many of the locals who complained rent…therefore they have no personal gain in mind. It does not affect them (until their rent increases) if their flat doubles in value. So their local protest was not motivated by greed.